After the Other Clark gets in the way of an undercover investigation Lois finally decides to figure just who this man is. She tracks him after work and despite seeing him walk into his apartment building is informed that he hasn't been there for some time. The next day Clark asks her out on a date and Lois decides that this might be the best way to get to the bottom of everything going on and says yes. Meanwhile, Superman heads to the Fortress and finds Steel holding the dying form of Superwoman. They examine her and find that even with the amazing technology in the Fortress they can't figure out a way to reverse what's killing her. Superman has an inspiration and flies off and while Steel isn't fast enough to keep up with Superman he can track the Man of Steel. Their flight is tracked by Hank Henshaw, who wants to find out what Superman is hiding. Story - 5: After an action-heavy arc that involved aliens and other worlds it was nice to read a relatively Earth based story. I am a huge fan of the Daily Planet as a setting and I love tales that focus on that element of the Superman world. I also appreciated that Lois got the spotlight in this issue. To me she is a vital part of Superman's world and the fact that she was often sidelined during the New 52 never sat well with me. This is a character that goes back to the very first appearance of Superman and while I do prefer her to be paired with Superman romantically I, at the very least, want to see her as an important part of the series and we rarely got that from 2011-2016. We not only got to see more of Lois in this issue but also another appearance by Maggie Sawyer. I loved the whole introductory scene of Lois undercover and Maggie on the case and Clark nearly screwing everything up. This led into Lois finally getting serious about figuring out what was up with the Other Clark Kent and Jurgens played that investigation just right. The bit where Lois follows him into his apartment building and then being told that there was no sign of him added that perfect touch of mystery. I am willing to bet that the doorman is in on the conspiracy but if he isn't it was still a great scene. My favorite part of this issue was having Clark ask Lois out on a date. I was expecting something far more sinister and Jurgens threw us another curve ball. I wouldn't be surprised if this Clark isn't an out and out villain but merely a pawn in the ultimate villain's game. If that's the case, bravo to Jurgens for leading us down the "there is something not right about this Clark and you should be suspicious of him" road. If Clark is an out and out villain, then his asking Lois out is also a great move because it makes us think his intentions are innocent only to find out that he's a bad guy. The fact that I am this invested in the story is a testament to the way Jurgens has sucked me in as a reader. The scenes with Superman, Steel and Superwoman were great as well. I've liked Superwoman as both a character and a series, so it's nice seeing these characters interact even if one of them is near death. 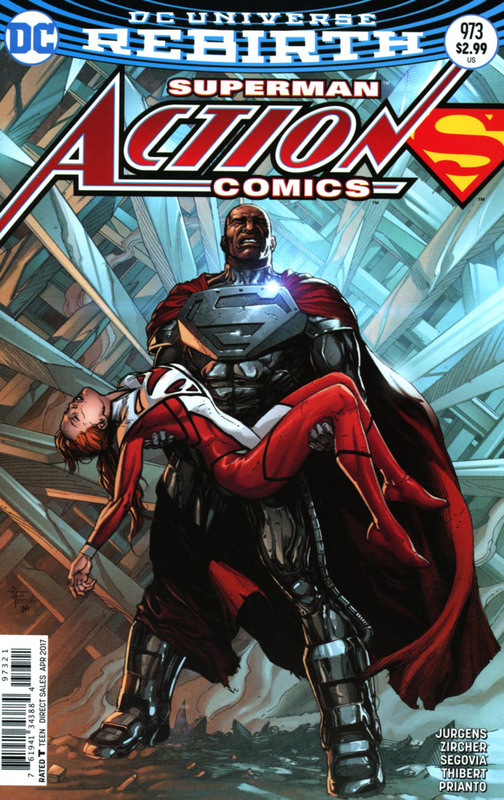 The final page with Hank Henshaw returning from the LOIS AND CLARK mini-series had me all kinds of excited. This storyline is shaping up to be as great as the previous arcs have been. And SUPERMAN REBORN is right around the corner. Art - 5: Mixing art teams can be a dicey prospect but this issue proved that it could be done smoothly. The first page where the panels kept switching between the two Clarks was amazing leading to a fantastic splash page of Superman over the arctic as was the full page shot of Steel holding Superwoman in the Fortress. The scenes in the bar with Lois and Maggie were just as good even if Lois looked a little too much like Rebecca Romain in her first panel. The art also sold the suspense of the scenes of Lois tracking down Clark. Additionally, I liked how part of Hank Henshaw's face was in shadow on the final page. The eye could be seen as glowing, which calls back to the previous Hank Henshaw becoming the Cyborg. Once again, the art compliments the writing and comes together to make the complete comic book package. 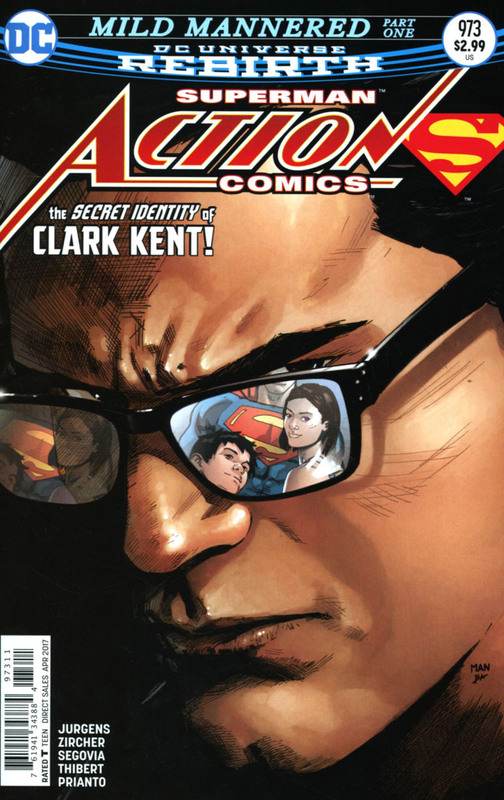 Cover Art - 5: This cover has a sinister vibe to it, which is fitting given how Jurgens has sown the seeds of distrust with this human Clark Kent. I like the reflection of Superman, Lois and Jonathan in the lenses and the lighting effects they used were really cool. Variant Cover Art - 5: It's rare to see a variant for this title that doesn't involve Superman. I like the echoes of CRISIS ON INFINITE EARTHS #7, which is a call back to a call back really. Steel looks great as does Superwoman despite her condition.